The derby will take place from July 7-9 with its home base at Mote, 1600 Ken Thompson Parkway in Sarasota, Florida. This derby is the first of four in the 2017 Summer Lionfish Derby Series coordinated by Reef Environmental Education Foundation (REEF). On July 9, approximately six culinary partners will compete to prepare the best lionfish dishes during the derby’s public event at Mote. Details below. 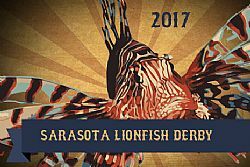 Register for the Sarasota Derby or others in the summer series: www.reef.org/lionfish/derbies. Mote Marine Laboratory, a world-class marine science institution, will host the Lionfish Derby in cooperation with Reef Environmental Education Foundation (REEF), which helps study and address the lionfish invasion and sanctions official Lionfish Derbies.